Ten or so years ago I wished for an in-depth training class on using DNA for genealogy. Genetic genealogists were mostly self-taught. Around that time Family Tree DNA started offering a two-day conference for project administrators. I wasn’t an admin at that time so I couldn’t attend. Megan Smolenyak and Ann Turner published their book on using DNA to Trace Your Roots.1 Colleen Fitzpatrick had a DNA section in Forensic Genealogy.2 Ann Turner had started the genealogy-dna mail list on RootsWeb.3 Other educational opportunities were mostly non-existent other than one-hour introductory presentations at conferences and seminars. You can’t do in-depth in one hour when you have to start with the basics. Five or so years ago a group of professional and aspiring professional genealogists discussed whether or not there was enough a genealogist needs to learn about DNA to fill a week-long institute course. My response was a resounding YES even as I got some very skeptical looks from others. I had already started a list of things I thought should be included. And this was before I knew much about autosomal DNA. I refined my list of potential topics. I sat in on sessions looking for good speakers who were knowledgeable about the topic. In my opinion, a good genetic genealogy speaker doesn’t just teach the scientific facts. The good genetic genealogy speaker, when speaking to a newbie or general audience, has to be able to choose the part of the science a genealogist must understand and eliminate the part only the scientist or DNA nerd needs. The good genetic genealogy speaker has to be able to relate the required scientific knowledge to what a genealogist already knows about research. The good genetic genealogy speaker has experience using the latest DNA analysis techniques and can demonstrate those techniques so any motivated genealogist can learn them. The good genetic genealogy speaker keeps up with the latest developments in the community. In 2012 I met and became friends with a group I felt I would enjoy working with and who I knew would present a course I would want to attend myself. In 2013 our course proposal was accepted. This year all of that planning becomes a reality as CeCe Moore, Blaine Bettinger, and I offer the first week-long genetic genealogy course at a genealogy institute in the U.S. – Practical Genetic Genealogy. Registration starts February 12th at the Genealogical Research Institute of Pittsburgh (GRIP) for the Practical Genetic Genealogycourse offered on July 20-25, 2014. The course outline is available at http://www.gripitt.org/?page_id=1147. I am looking forward to this so much as I hope we can help others learn what I wish someone had been around to teach me ten years ago. 1. Megan Smolenyak Smolenyak and Ann Turner, Trace Your Roots with DNA (Emmaus, Penn., Rodale Press, 2004). 2. Colleen Fitzpatrick, Forensic Genealogy (Fountain Valley, Cal., Rice Book Press, 2005). 3. Ann Turner, founder, Genealogy-DNA List on RootsWeb ( http://lists.rootsweb.com/index/other/DNA/GENEALOGY-DNA.html). 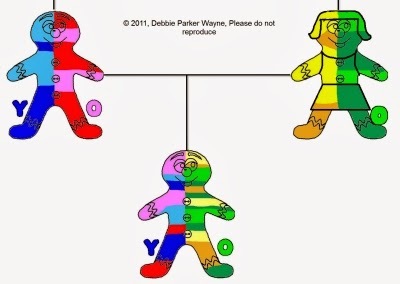 Debbie Parker Wayne, "Registration Feb. 12th for Practical Genetic Genealogy at GRIP," Deb's Delvings Blog, posted 9 February 2014 (http://debsdelvings.blogspot.com/ : accessed [date]).